I’ve finished the workshop, and I worked some busy days, and a major weather front came through and knocked me out… so this isn’t really a normal WIAW post. 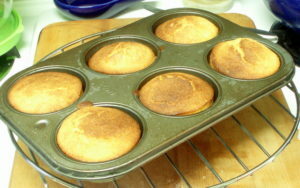 But I am finally posting about the corn muffins I’ve been showing you for a while, so that seemed fair enough. For food – we’re finally getting an assortment of fresh vegetables in at Greenmarket. 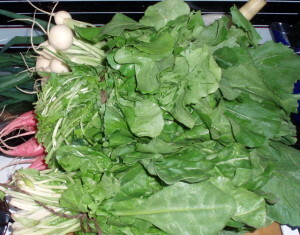 Several kinds of cooking greens, and scallions, radishes, arugula and lettuce for salads. 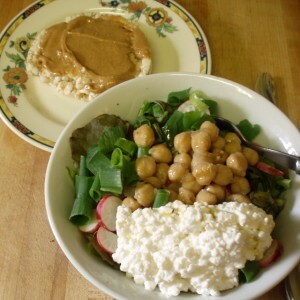 So I’ve now switched over to my salad lunches – which I eat for months on end without tiring, as I have different assortments of vegetables and accompaniments each day. Dinner, though, the last few days has been “Point Rich at the kitchen while I go to bed with my meds” – so no pictures… Previously cooked beans, rice, chicken, vegetables… it’s dinner. I’m grateful. I’m happy now with the muffins, though, so I’ll share them. Masa Harina is meal made from corn (maize) that has been treated with an alkaline solution, a process called nixtamalization. 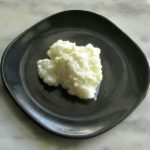 (Southern hominy is made the same way.) This does several things… It softens the very hard grain, making it easier to grind, which may be the reason it was done in the first place. It makes niacin available to the body, preventing pellagra, which can otherwise be a serious problem in cultures dependent on corn. And it allows the meal to hold together and form a dough, which can then be used to make tortillas and tamales. 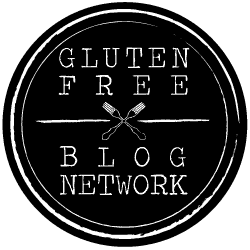 And wheat free corn muffins?? The more I thought about it, the more I wanted to try this… I can get masa harina easily, here. I played with variations. I tried different ratios of corn meal to masa harina, and settled on a ratio of 4 parts cornmeal to 1 part masa harina. 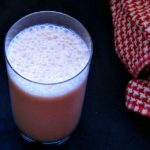 I made some with buttermilk (because I had it) and baking soda, which I liked – but I decided that since I, at least, had often avoided a recipe because it needed buttermilk, when I didn’t have it, I needed to give you something else, as a basic. And, in general, I stripped this down to be easy – I was making these for breakfast, so I needed mindless and fast. 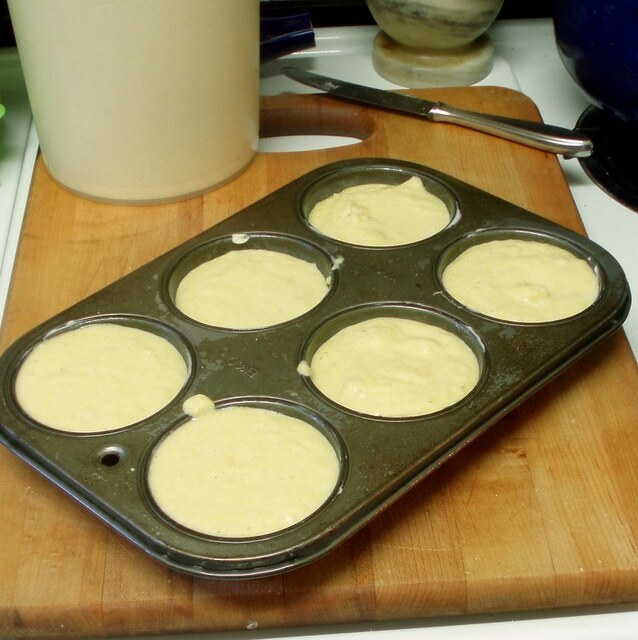 (I may work further with that concept… ) There’s nothing like hot muffins half an hour after I reach the kitchen! First, preheat the oven to 400°. 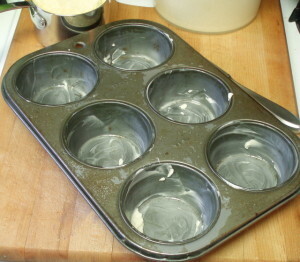 Then grease your muffin tin. 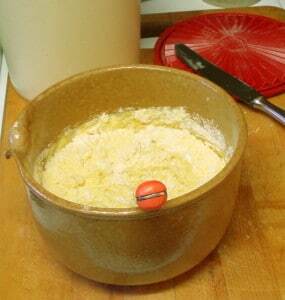 Do this first, so you don’t stop and fuss around after the batter is mixed. 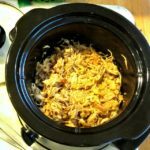 I’ve recently returned to buttering tins – I find it works better than using oil. I used to use the non-stick sprays, but now that I sell cookware I’ve learned about the residue they leave, and prefer to avoid them. Beat an egg in your bowl. I use a table fork to beat it, for this. Then add milk, salt, and oil. You can use melted butter – it will taste better – but I’m not melting butter before breakfast. 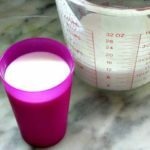 I sometimes even measure the milk first right in the pitcher, then add the egg and beat it, to save dishes – the egg doesn’t beat as well, but I still have decent results. And though the salt is usually added to the other dry ingredients, I add it to the liquid, as I think it distributes better as it dissolves. 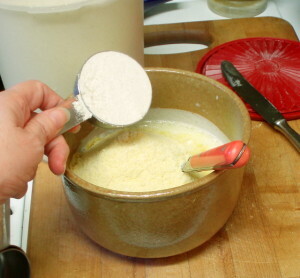 Properly, you should then mix all the dry ingredients in a separate bowl, then add them to the wet. 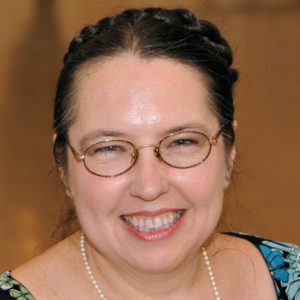 But – before breakfast… Working quickly – I assemble everything first, that makes a difference – I dump the cornmeal, and masa harina on top of the liquid, and the baking powder on top of it. Now, the baking powder will start to react as soon as it gets wet, so I use my fork to spread it around in the cornmeal so it doesn’t clump. Then I quickly mix the whole thing together. 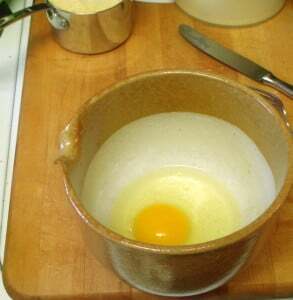 I wrote the recipe to be made Correctly – that is, beating the egg and mixing the dry ingredients seperately. I did want to show the shortcut, though be aware that it is a shortcut… but if the extra bowls stand between you and muffins in the morning, go for the shortcut! Eat imperfect (but pretty darn good) muffins. Beat the egg. Beat in milk, salt, and oil or butter. 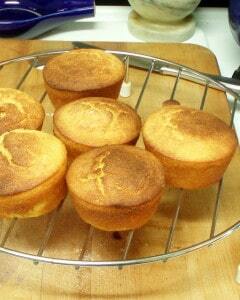 Mix cornmeal, masa harina, and baking powder. Stir quickly into liquid ingredients. 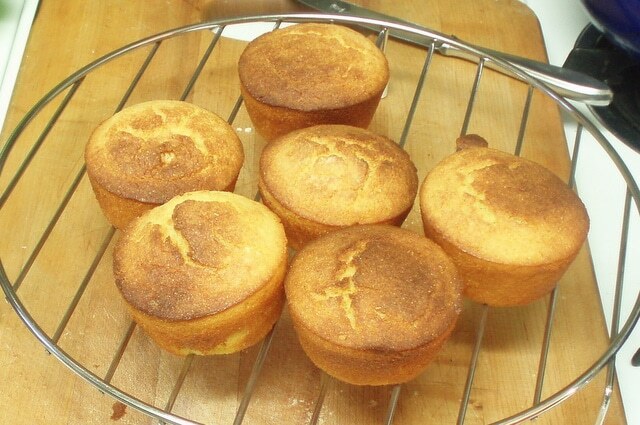 Divide between 6 buttered muffin cups. I actually do the same thing with the salt myself when baking. 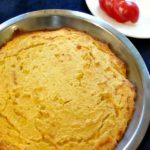 I've never tried to make corn muffins with just corn and without wheat, but it's a wonderful idea, especially for those who have wheat allergies. 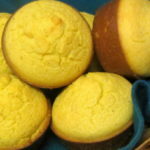 Now I'm in the mood for a corn muffin! These look really yummy! My kids love corn muffins---neat to be able to make them without wheat:) I am visiting you back because you stopped by today. Thanks for visiting. Hope you have a great week.